No one knows why Jordie, a Jardine’s parrot, started plucking out his feathers. It might have been out of boredom from being in a too-small cage with no toys or anything to entertain him or he might have suffered from malnutrition. His behavior suggests he might have been physically abused as well. 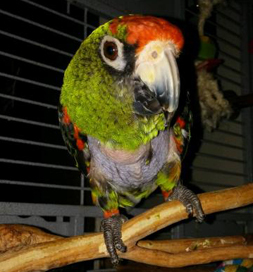 By the time he came into rescue at Parrot Education & Adoption Center (PEAC) about 10 years ago, he had a 2-1/2-inch naked band around his body. Jordie keeps a close eye on Tausha and often follows her around the house when he wants to be fed. When Tausha Hope of El Cajon, CA, saw Jordie on Petfinder, he looked pitiful, but she already had several special needs birds and her heart went out to this bird who had been in several foster homes. She arranged to meet him at a bird expo. She applied to adopt him. A prerequisite was to participate in two PEAC seminars about exotic birds. There was also a home visit. She waited anxiously to hear the outcome. Finally, the call came; the adoption had been approved. She drove two hours to Jordie’s foster home and met “his wonderful foster, Dory,” under whose care he had stopped his plucking. The damage to his follicles is permanent, however, so the feathers probably won’t grow back. Dory bundled up Jordie’s favorite things for the trip — and then he was on his way to his permanent home. Tausha is intent on educating people about exotic birds. They are being surrendered at an alarming rate, she says, because people think they are low-maintenance pets and find out otherwise. If neglected, they will not thrive. Education before adoption is the key. Read more.